Monacite - mineral enough difficult composition: it can include some rare-earth elements in a few (cerium, lanthanum, neodymium), and also two-bits of praseodymium, Pr, Samaria and gadolinium. Can be present also uranium, thorium, calcium, sometimes in a noticeable amount. The crystals of Monacite have a changeable type: they are thin, plate tablet lamellar or extended along a vertical ax; but there are isometric and short-prismatic. Some crystals of Monacite from granites and pegmatites arrive at weight in a few ten of kilograms (handing over the state is obligatory). Surfaces of verges often are wrong form and streaked. By sight Monacite often an anthracite at pluggings in granites and pegmatites reminds coal. 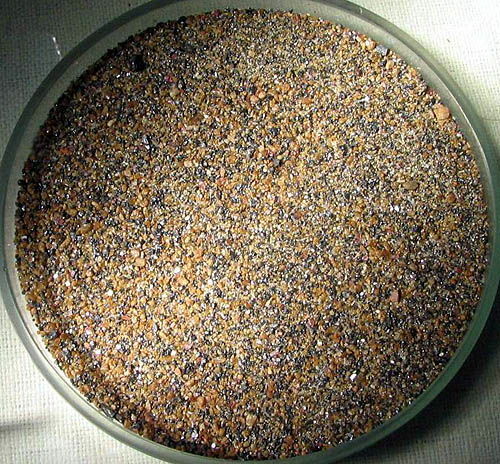 Monacite, concentrated in sands as a result of destruction of primary Monacite-contain rocks, often presented grains. Colouring of mineral is changeable - from yellow to reddish-brown and from light-gray to greenish to black. 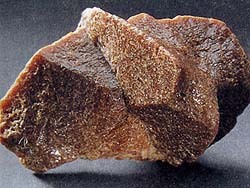 Brilliance of Monacite varies from semidiamond and glass to waxen. A mineral is sometimes transparent, radiate x-rays, differs hardness and weight, easily divided on cleavage. Chemical composition (chemistry, compound). Changeable; approximate composition: ceria (Ce2O3) 26-31%, sum of oxides of lanthanum (La2О3), neodymium (Nd2O3), praseodymium, Pr (Rr2O3) 21-30%, yttria (Y2О3) 0,5-3,5%, thoria (Th2О3) 1-28%, five-oxide of phosphorus (P2O5) 22-31%, oxide of zirconium (ZrO2) to 7%, silex (SiO2) to 6%, general maintenance of ceric rare earths (in an oxydic form) 50-68%. Cerium (Ce) a malleable ductile steel-grey element of the lanthanide series of metals, used in lighter flints and as a reducing agent in metallurgy. Symbol: Ce; atomic no. : 58; atomic wt. : 140.115; valency: 3 or 4; relative density: 6.770; melting pt. : 798 oC; boiling pt. : 3443 oC. Form of crystals. 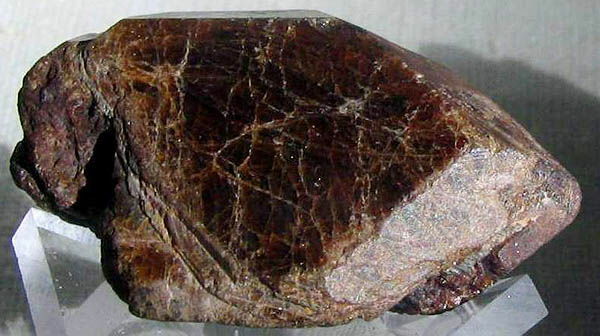 Tolstotablitchatye, rarer prismatic shallow crystals, sprinkled in a rock (cuts, syenite, diorite greenstone, gneis); sometimes Monacite forms large, weighing to a few kilograms crystals in pegmatites. A mineral usually be found as separate grains, sprinkled in a rock. Class of symmetry. Prismatic - 2/m. Cleavage. Sometimes perfect absolute to on (001), (100). Aggregates. Forms separate grains. Possesses weak radio-activity, refractory and does not dissolve in water. At heating becomes grey. Almost not melt fuse. A behavior is in acids. Hardly dissolves in HCl. Colors light-yellow, gold, dark-brown, red, rarer green. Not do by his diagnostics without application of the special dosimeter !! Accessory mineral granit and syenitic rocks; be found as distinct crystals in pegmatites of the indicated rocks. Monacite-contain (Monacite) sands (so-called "Babylonian sands of time") are widespread in Brazil, India and Australia - radio-active, and dangerous - their uncontrolled visit is forbidden (from 24-32 milliroentgen/hour and higher). It is the not usual deserts, not beachs and not place for walks. You will turn the special attention on Monacite top a page is a not cinnabar vermilion gypsum selenite (visual likeness with the deserted gipseous formings) !! Similar hard Monacite "roses of the desert" are the imitators of gypsum and very dangerous in home collections and in office displays - they are found mainly not on-the-spot, but in the layer of sands of the radio-active Monacite deserts. Be vigilant - not visit a place with the enhanceable background of radiation (from 32 to 120 milliroentgen/hour and higher) uncontrolledly, pick up no objects, stone and standards, and not take away them from places with the permanent enhanceable background of natural radiation (Monacite deserts, waste, wilderness) !!! The best standards are supplied from Norway and Madagascar, states of Colorado and Wyoming (USA). Little, but having a good form transparent crystals of the orange-yellowй or розовато-yellowй colouring, valued collectors, are in alpine vein, lode, mines in many places. If you are a not fanatic, working in the specialized departments of state storage depository and museums, it is not recommended collect it radio-active mineral - it is not kept at home. 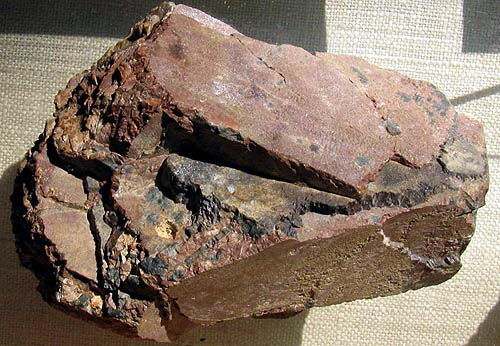 Monacite-contain sands, widespread in Brazil, India and Australia, are used for industrial development for extraction of cerium and thorium. Keeping in home, office and personal collections (including glass clepsidre, it is a device for measuring of time as a vessel, evenly, drop after the drop of filled by water the level of which is shown by past time; clepsydras) is categorically forbidden. 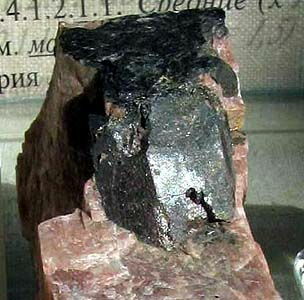 Can meet in granites (inclusion, by sight reminding an anthracite) - Monacite inclusion more frequent than all and do a granite radio-active is an obligatory withdrawal and handing over of radio-active Monacite strictly obligatory the state of Ukraine (retribution). 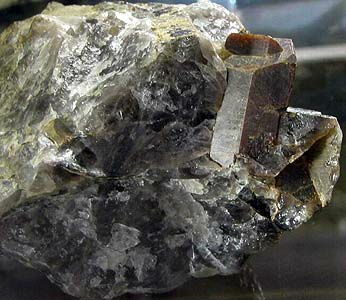 The withdrawal of granite with including of Monacite does his surroundings safe from a radiation (the withdrawal of all of granite is not made). Rock music group of "Kipelov" glorifies is a song "The Babylon" (cerium Monacite-contain sands deserts, imgs). Monacite in a microcline. Chkalova lived, Chupinskiy region, Sitting down. Karelia, Russia, CIS. Monacite. Ambatufucikeli, Madagascar. A photo: © A.A. Evseev. Risk of fire. Flammable or combustible matters can catch a fire from sparks or flame. Can contain self-reactive matters, apt at exothermic decomposition in the case of heating, contact with other matters (such as: acids, compounds of heavy metals or amines), to the friction or blow. It can result in the selection of harmful or flammable gases or pair or spontaneous combustion. Capacities can burst at heating (dangerous, perilous - does not burn practically).